As you may know already during December we are running a competition to give away no fewer than six fabulous LG Optimus smartphones. All you have to do to enter is click here and fill out a quick survey. So what are you going to win? Here’s the lowdown on the innovative new smartphone. 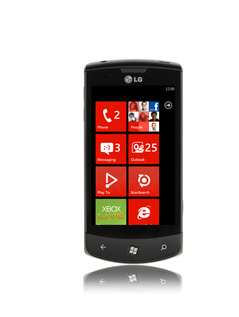 LG recently launched the Optimus 7 E900, their first venture into the Windows Phone 7 ring. It’s a solid touchscreen phone with an easy to use interface. It has a good weight and feels well-built with its back cover constructed from a durable metal. Like other Windows 7 phones, the Optimus has three buttons on the front: Back, Home and Bing search. Unlike some handsets the LG model had proper physical clicking buttons, rather than the touch-sensitive ones, making it just a bit easier to use. The Optimus 7 has a 3.8-inch WVGA LCD display, with a resolution of 800×480 pixels. In other words there is no blurriness, users can clearly make out detail and the colours are incredibly vivid. Although the phone is fairly large it can still easily fit into your pocket and is good for watching videos and viewing pictures. Due to Microsoft’s strict minimum hardware specifications, most of the Windows Phone 7 devices have similar specs including approximately 8GB of memory, a 1GHz processor and at least a 5-megapixel camera. However, the Optimus differentiates itself here by packing 16GB of on-board storage. This is particularly useful for users as Windows Phone 7 does not support external memory cards. Again all Windows Phone 7 handsets have the same user interface, which we will delve into further in our “everything you need to know about Windows Phone 7” post. However, some of our favourite features include the integration with Xbox Live, Zune music and Office. The phone operates through six hubs: People, Games, Pictures, Music and Video, Market Place and Office. These hubs are some what interactive, for example your avatar in the Games hub will be supplied from your Xbox Live account. To launch a hub you simply flick the screen right to access the next screen. The screens are on a loop making it quick and simple to navigate through. Also on the home screen sit static tiles which you can set up to work as shortcuts to applications. Windows 7 also has its own dedicated app store called the The Marketplace. The number of apps is growing quickly as many developers already familiar with Window’s platform have begun to develop apps for the new phones. Most apps start at 79p.. The Optimus 7 comes pre-loaded with a number of apps including a fun panorama app and the ScanSearch augmented-reality app. The panorama app makes it easy to take snapshots of wide landscapes by lining up five images in a row, and automatically firing off the shutter when each image is aligned. ScanSearch, which is unique to the phone, is an Augmented Reality app that automatically detects any amenities up to a five-mile radius. The results including: restaurants, bars, hotels, public transit and banks, appear as icons, which you can then tap to reveal that specific amenities phone number and exact location. The Optimus 7 has a 5-megapixel camera and comes with an LED flash, which is always useful if you are trying to take a picture in dimly lit rooms. The camera has a number of other noteworthy features including the automatic ‘intelligent shot’ which is useful if you want to quickly catch that snapshot. In addition to taking photos, it is also capable of capturing 720p high definition video. Or if you want to get that cinematic feel, you can even capture video in a 16:9 aspect ratio. Sharing media from the Optimus 7 is made very simple through LG’s DLNA sharing feature “Play To.” This allows you to transfer your music, photos and video to any other DNLA-equipped device, such as your TV, provided that it is on the same Wi-Fi network. The LG Optimus 7 is a fast and easy to use phone with a number of great features. I have recently bought new lg and i am looking for skin on it to provide protection from scratches and any other sort of damage. I wouls so rather have this than an iphone. The iphone apps are too expensive and it has less versatility. It doesn’t have the largest capacity battery as the Samsung Omnia 7 also has a 1500mah battery.